The Black Diamond 5.5" Shear set comes with a 5.5" shear and a 30 tooth texturizer. The shears are forged and ergonomically designed by master craftsmen. The new Kamisori Black Diamond shear has been perfected with an even higher degree of sharpness, comfort and durability. The set is perfect for all-around cutting, blending, and thinning on both wet and dry hair. These are high quality, professional hair shears that will last 20-25 years if cared for. Kamisori shears are known throughout the beauty industry for their genuine Japanese steel that will retain a great edge. 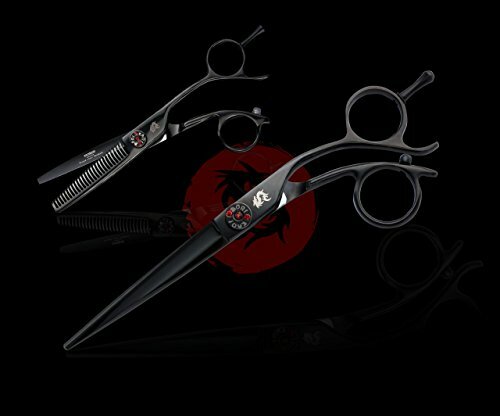 The Black Diamond shear set is one of the most popular sets because of its quality and versatility. If you have any questions about this product by KAMISORI, contact us by completing and submitting the form below. If you are looking for a specif part number, please include it with your message.